Housing associations angered by Tory plans to expand the government’s right-to-buy scheme will launch legal proceedings in a bid to halt the move – citing the demise of Britain’s social housing sector as a possible outcome. In a bid to woo Conservative voters in advance of May’s general election, the Tories announced plans on Tuesday to force housing associations to sell off homes at a fraction of their market value. The policy was mooted by Prime Minister David Cameron despite the fact it would cripple housing associations, and potentially plunge the non-profit organizations into bankruptcy. Tony Stacey, who acts as chair of the South Yorkshire Housing Association, previously floated plans to launch a legal challenge against such a move in March. “This is so fundamentally critical to us. It would shoot up to the top of our risk map if it was confirmed. We are duty bound morally to fight it in any way we possibly can,” he told UK trade publication Inside Housing. Other housing association chiefs also predict a legal challenge will surface, with some warning the Conservative Party’s proposed policy threatens to jeopardize Britain’s entire social housing sector. The Tory love affair with privatization is widely acknowledged. However, plans to expand the government’s right-to-buy scheme are about more than macroeconomics. Industry sources also suggest charity law would have to be altered if the policy shift goes ahead because charities – including many housing associations – are generally banned from selling their assets at less than market value. Cameron’s suggested policy shift was met with contempt by Labour’s ex-housing minister John Healey, who said the move was a “cheap Thatcher tribute act” that would ultimately compound Britain’s housing crisis. Britain’s recovery from a grueling recession that threatened to derail its economy has been lauded by serving ministers and the IMF. Nevertheless, the state’s housing crisis is estimated to be more serious today than it was 50 years ago. Central to this crisis are some of society’s most crippling ills: homelessness, social cleansing and soaring property prices. The sheer scale of the issue was highlighted last month at ‘Homes for Britain’ – an event held in central London to raise awareness about the problem. Estimated to have been the largest housing justice rally in UK history, the event was attended by up to 2,500 campaigners. Among those who spoke at the rally were veteran filmmaker and socialist Ken Loach.Addressing the crowd, he said the housing crisis is a “disgrace” in such a rich country. He said the problem was far worse today than it was 50 years ago, with “93,000 kids homeless” across the state. In a bid to address the crisis, Loach said the government should adopt a far-reaching government building scheme similar to Aneurin Bevan’s in the 1940s, whereby builders, planners and architects were directly employed by the state. 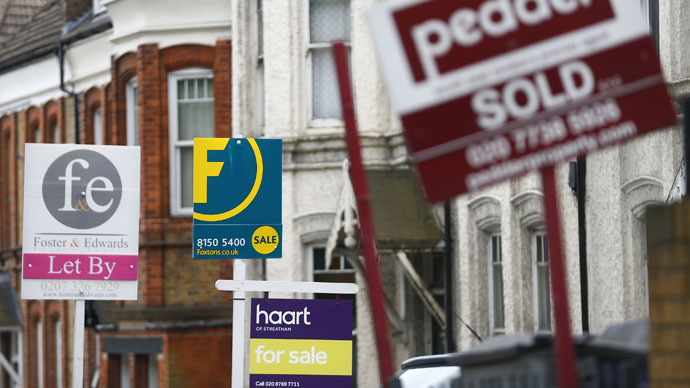 Britain’s housing crisis has become a focal point of the 2015 general election race. Addressing crowds gathered in Dalston, East London on Tuesday, the Green Party condemned Britain’s soaring rents and rising levels of social cleansing. Criticism of Conservative plans to expand the government’s right-to-buy scheme coincides with ‘March for the Homeless 2015,’ an international day of protest to raise awareness about homelessness. As part of the global day of protest, social justice campaigners took to the streets of cities across Ireland, England, Scotland, America and Canada. A report published by the Department for Communities and Local Government last month found that levels of homelessness in London rose by 37 percent between 2013 and 2014. The crisis prompted housing charities to call for sweeping reforms.